Craving succulent flavorful Chicken Shawarma? 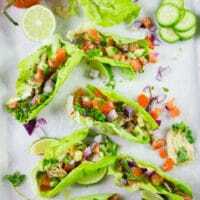 Serve these Chicken Shawarma Lettuce Cups as an easy healthy chicken recipe that packs all the flavors and spices of shawarma while still being low-carb and guilt-free! 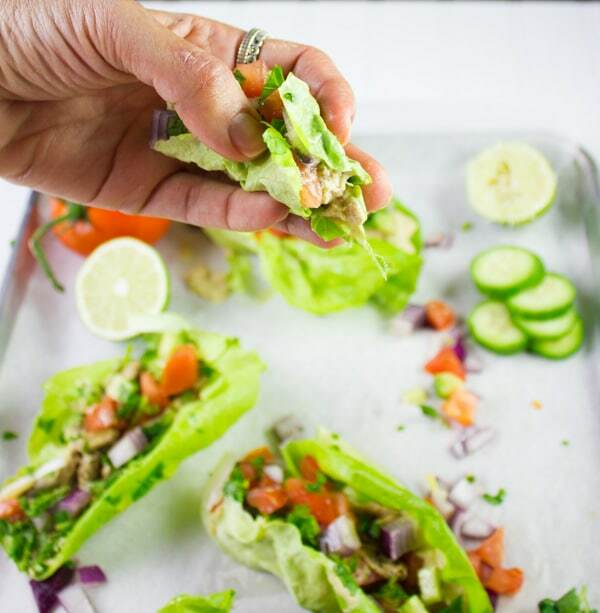 This recipe for Chicken Shawarma Lettuce Cups is a perfect example of finger licking deliciousness minus the calories and the carbs. With the playoffs, I LOVE having healthy flavorful options like these Chicken Shawarma Lettuce Cups because everyone’s sick of salads already. Imagine all the flavors of chicken shawarma in a little lettuce wraps served with some hummus, fresh herbs and diced tomatoes! 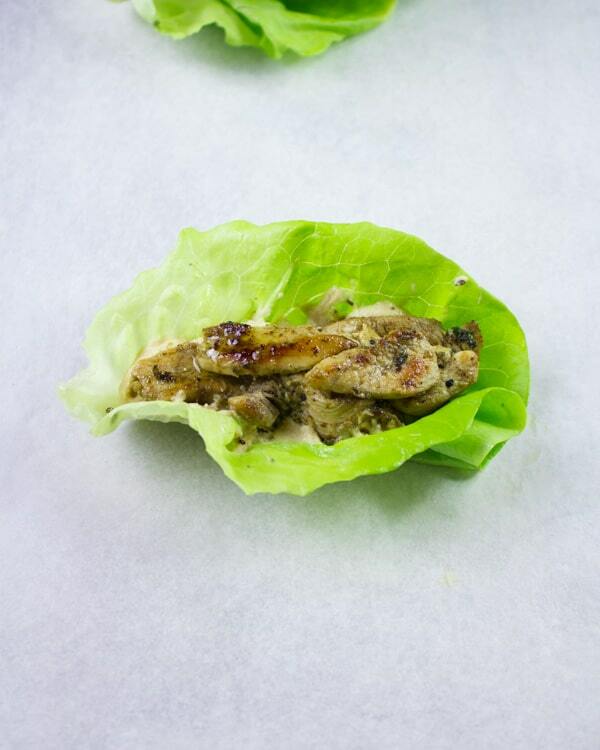 You need to try this recipe for Chicken Shawarma Lettuce Cups. It’s a healthy way to get the taste of your favourite Middle Eastern Take-Out food, minus all the empty calories from carbs and fat. 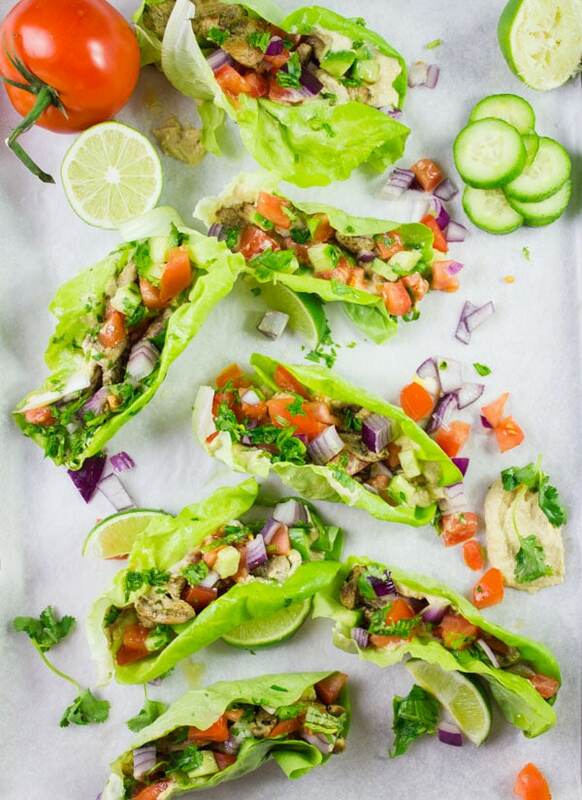 The beauty of these chicken shawarma pick me up lettuce cups is that they’re really different from your good old fajitas or your classic shawarma. It’s like they’re a fusion, the best of both worlds. 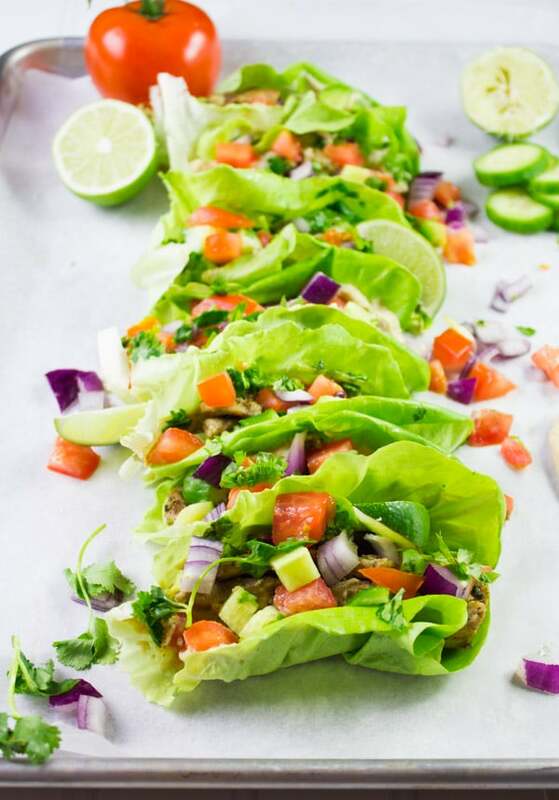 This recipe for Chicken Shawarma Lettuce Cups is just perfect for a healthy light dinner or for entertaining! Need some party food or TV snacks for the next game? Look no further! The chicken is flavored with all the classic shawarma spice, and then some El Yucateco® Green Habanero sauce is added over to infuse much more flavor—real habanero flavor. 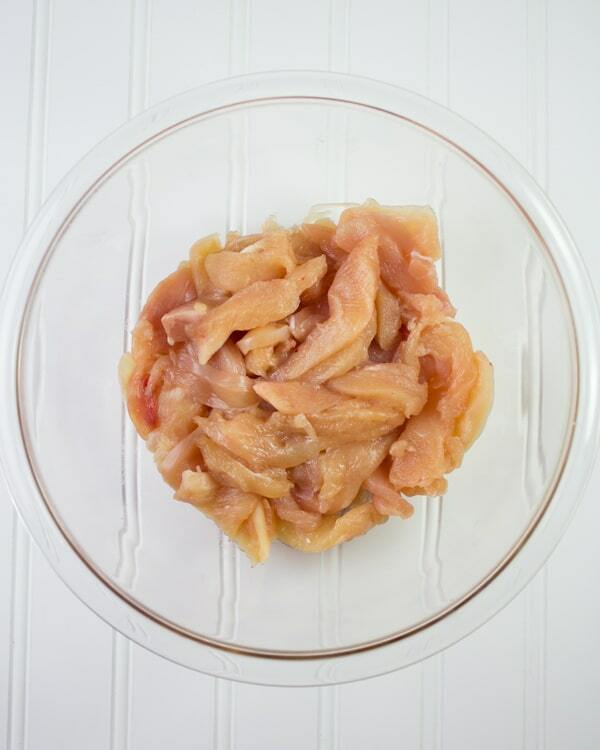 Cut the boneless, skinless chicken breast into small strips and put them in a glass bowl. 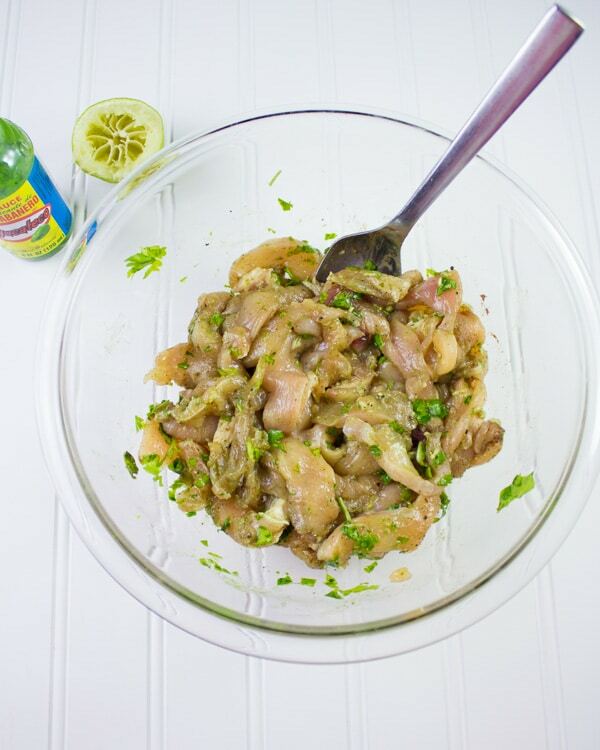 Season the chicken with salt, pepper, oregano, minced garlic, allspice, fresh cilantro and lime juice. 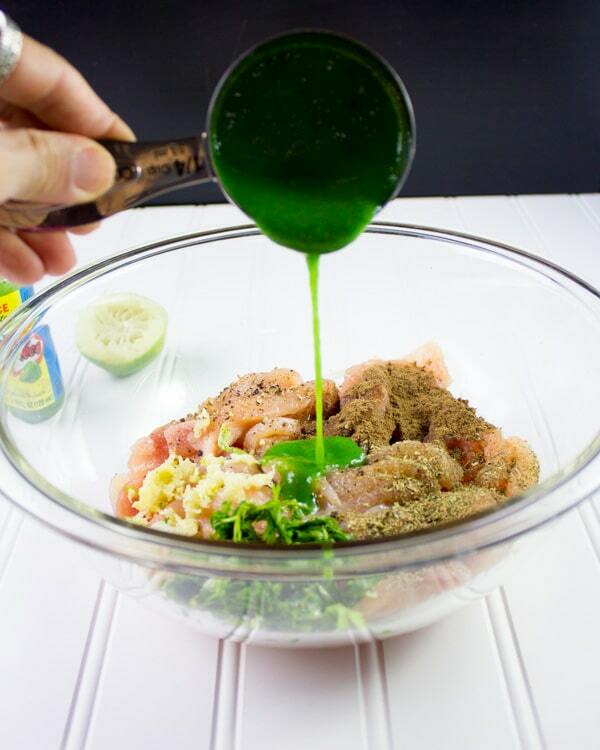 Add a heaping quarter cup of El Yucateco® Green Habanero sauce. Toss everything together and sauté the chicken over high heat until cooked through. Then comes the fun part, assembling the chicken wrap. 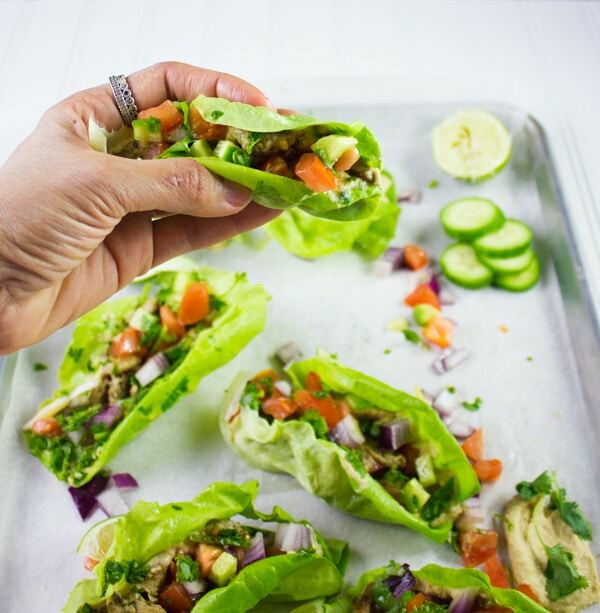 I love using Boston lettuce cups because they’re pliable and easy to shape, yet they’re sturdy enough to handle my toppings. 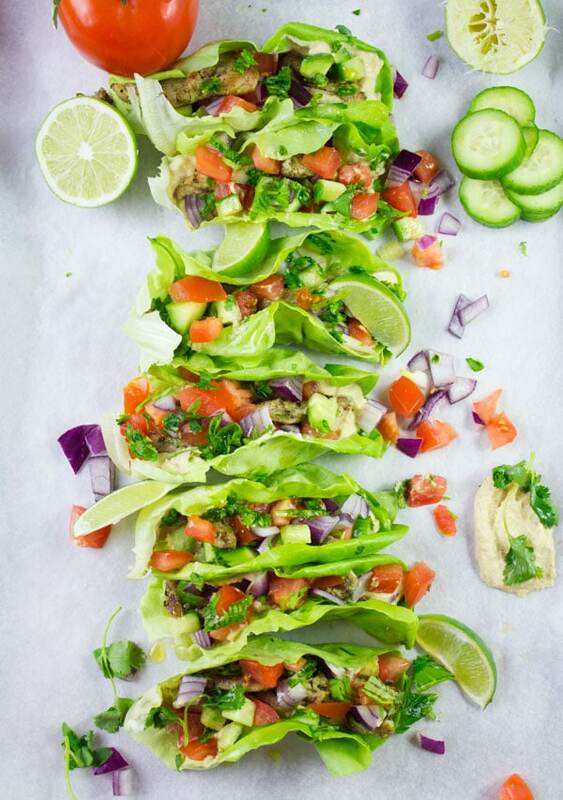 A spread of hummus at the bottom of the lettuce is essential to get all the fillings and toppings to stick together and it adds so much flavor. I pile up the flavor-packed chicken over the hummus, add some diced tomatoes, red onions, cucumbers and a mixture of chopped parsley and cilantro leaves. A squeeze of lime over that and your Chicken Shawarma Lettuce Cups are all set. 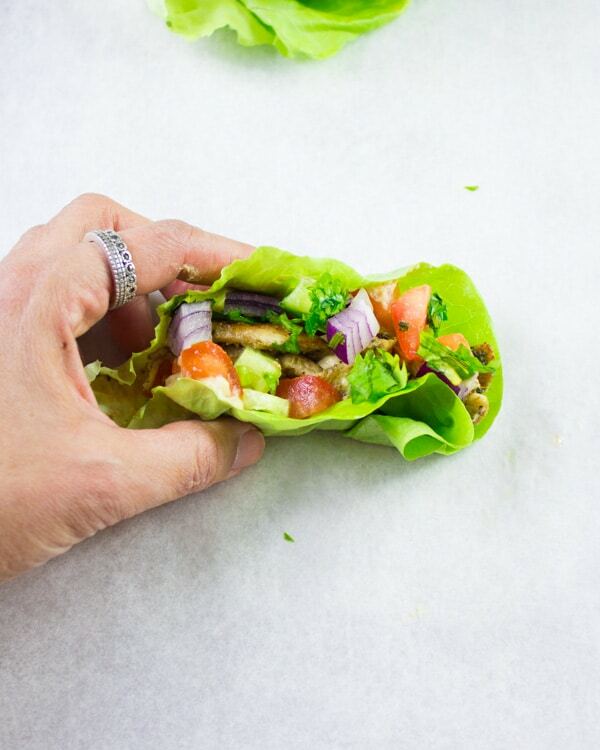 Once all your toppings are piled up, press the wrap firmly with your fingers so it holds together. Arrange those healthy bites of Chicken Shawarma goodness on a tray and watch them disappear at your next Game Time party or gathering. 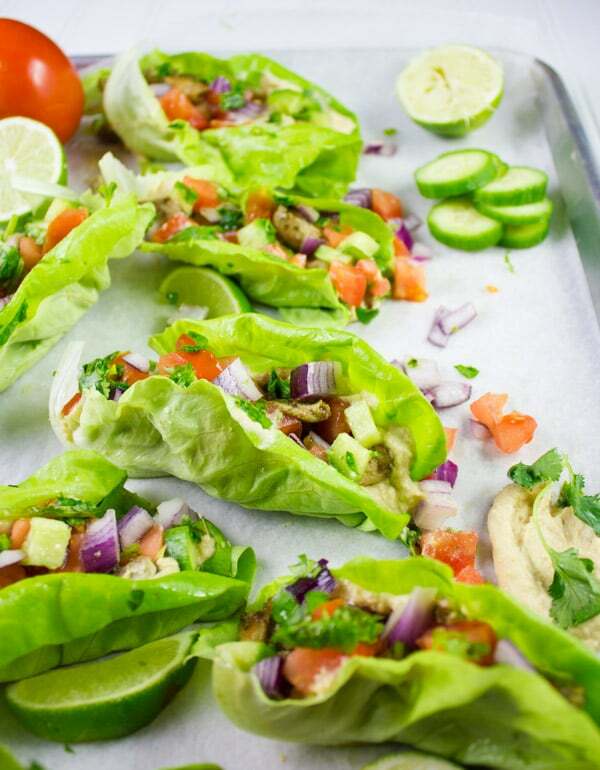 These Chicken Shawarma Lettuce Cups can be made in advance and kept in the fridge. You can prepare the chicken and toppings and let your guests assemble their own wrap—like a taco/fajita bar! You can definitely use store-bought hummus, but I would urge you to make this Ultimate Hummus Dip if you can spare 5 more minutes. 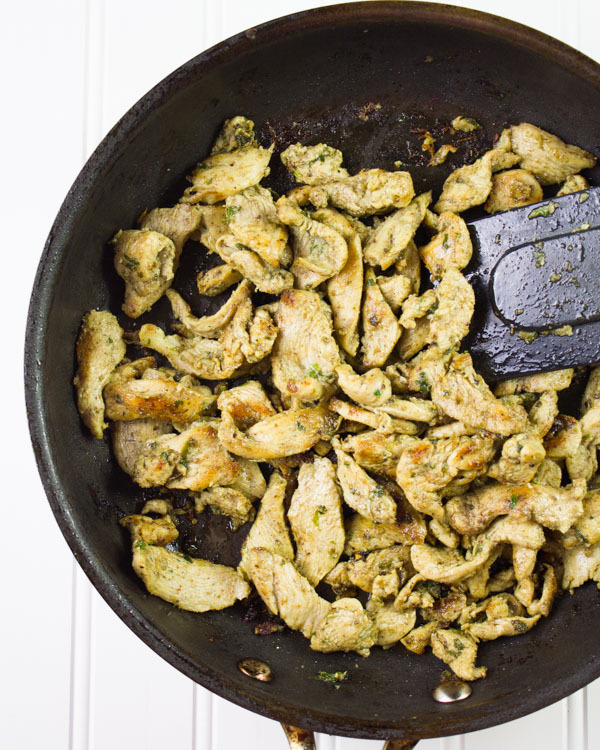 In a large bowl, add the chicken and all ingredients for the shawarma without the oil. 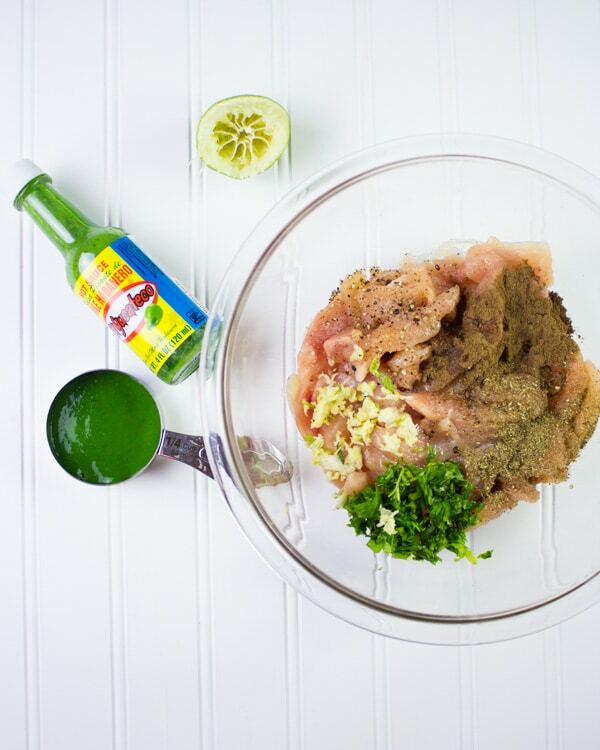 Toss the chicken and flavoring together and set aside to infuse the flavors for 10 minutes at least and up to 1 hour. In a large skillet over high heat, add the olive oil. When the skillet is well heated, add in the chicken. Sauté the chicken stirring every minute until it’s cooked through and slightly golden. Turn off the heat and allow the chicken to cool for just a couple of minutes to be easier to handle. 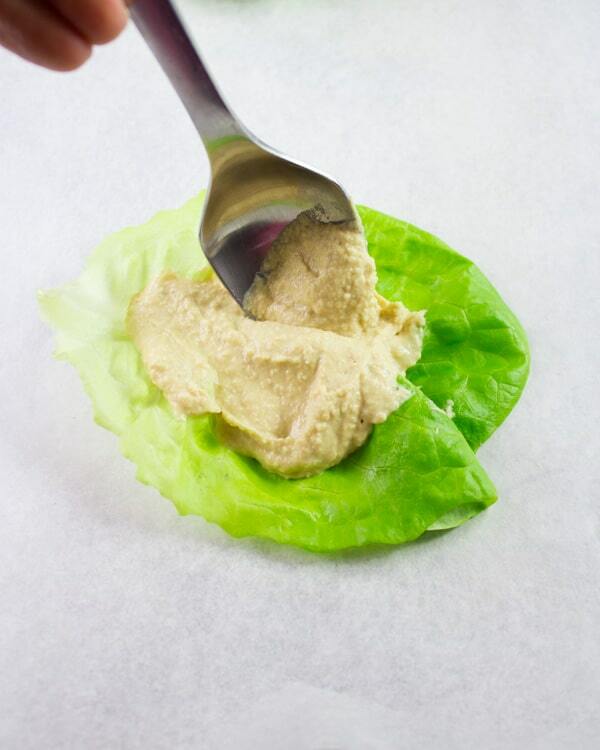 Take one lettuce leaf at a time, and spread a tablespoon of hummus (here's my recipe for homemade hummus) over the length of the lettuce and going slightly to cover half the sides. Pile up some chicken over the hummus and top that with tomatoes, cucumbers and onions. Sprinkle some chopped cilantro and parsley and a squeeze of lime. 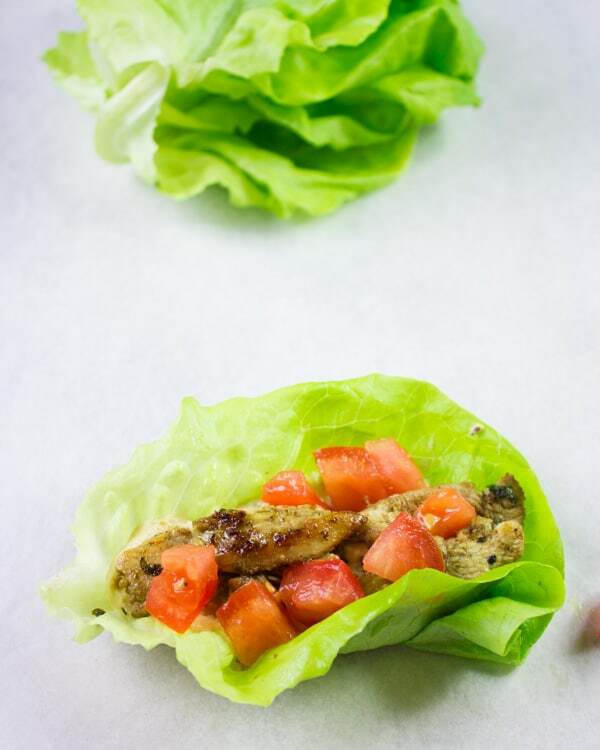 using your fingers, press the chicken wrap firmly so the sides of the lettuce stick to the toppings and holds its shape. The hummus will make the whole wrap stick together. Arrange the chicken shawarma wraps on a tray and serve. This recipe can be prepared 8 hours in advance, wrapped and kept in the fridge. It will be served cold in that case. The chicken and toppings may be prepared separately 2 days in advance. The chicken can be heated a the time of assembly. Thanks Adriana! It was such a pleasure working with these fabulous hot sauces again!! I’ve made this recipe a few times already and it’s always a hit! these are so so awesome! love that shawarma flavor – brings me back to my time in Kuwait. 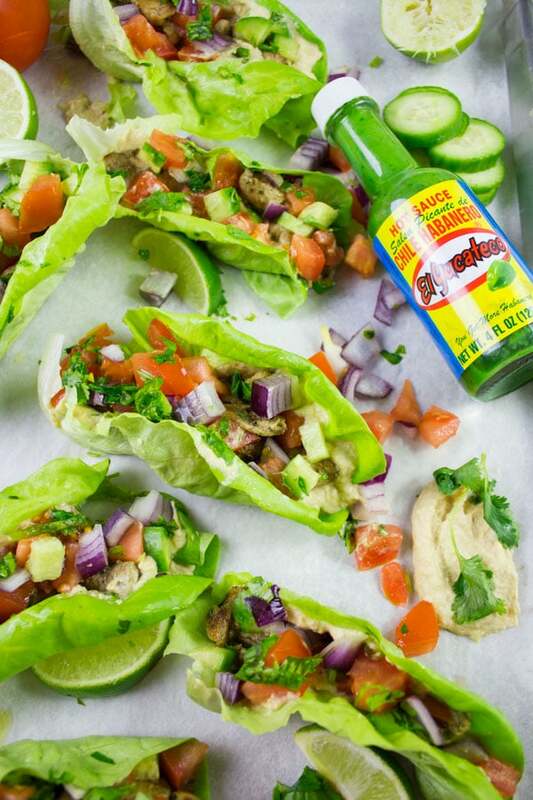 that hot sauce sounds incredible with these too – so much deliciousness! 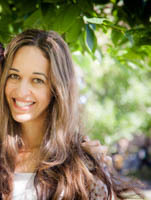 Danielle, hope you make it! These look so tasty. All of the fresh herbs and citrus sound wonderful. I know my family would love to eat this for a weeknight meal! I love Shawarma!!! Your flavours are bang on too, and I love that you use the lettuce to wrap it instead of the traditional pita. Delish! Fantastic chicken recipe! And one of those shawarma recipes that you never get tired of! Love how easy and healthy it is – I just can’t wait to try it!